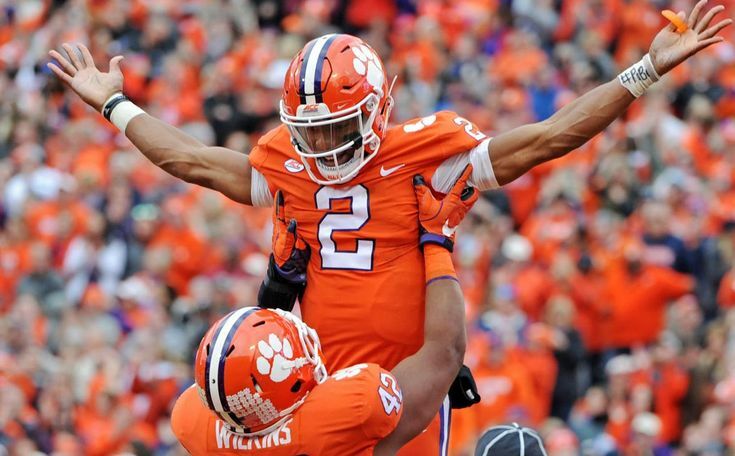 Ever since Clemson hired Chad Morris as its offensive coordinator prior to the 2011 season, the Tigers have consistently had one of the top offenses in the nation statistically. Morris brought with him the spread offense that he learned from Gus Malzahn that featured power running and lots of misdirection. In 2015, Morris was hired as the head coach of Southern Methodist University. His co-offensive coordinators, Tony Elliott and Jeff Scott, did a good job of keeping the base of Morris’ original scheme intact, and they also added some nice wrinkles to the offense as well. Scott and Elliott expanded Clemson’s RPO package. Let’s delve into one of Clemson’s best RPO schemes that they have used over the last three seasons. The offensive line will block inside zone with the backside of the offensive line “locked,” meaning they will base block on the backside defensive lineman and leave the backside linebacker alone. Doing so will give the quarterback better protection in case he throws the ball and isolates the MIKE linebacker for the QB to read him as his run/pass key. If the MIKE linebacker expands to the hitch route by No. 3, the offense will most likely have numbers in the box and the QB will hand the ball off to the back on the inside zone play. If the MIKE stays in the box to play the run, the QB will pull the ball and the running back will bend back to block for the QB. The QB will then either throw the hitch route by No. 3 or No. 2 depending upon the nickel defender. If the nickel defender is expanded to No. 2 or splitting the difference between No. 2 and No. 3, the QB will throw the hitch route to his No. 3 receiver. If the nickel tightens down to the No. 3 receiver, the QB will throw the hitch route to his No. 2 receiver. If the defense is in a two-high structure, the offense will have a 3-on-2 advantage on the defense. The defense is left with just the MIKE linebacker and the nickel defender to play the run and the two hitch routes, so the offense, in theory, should have the advantage somewhere. The way the defense can match these numbers is by rotating to single-high and dropping the strong safety down. Now the MIKE linebacker can play the run and the defense still has two defenders on the outside to play both hitch routes. But by rotating the free safety to the middle of the field, the offense now has a 1-on-1 opportunity to the single receiver side. The single receiver will run a hitch versus off coverage that could convert to a fade route against either press or cloud coverage. If the QB sees the defense rotate to single-high, he will still read the MIKE to confirm he is playing the run, but instead of keeping his eyes to the backside of the formation to read the nickel defender, he will flip his hips and get his eyes to his No. 1 receiver to throw either the hitch or the fade depending upon the positioning of the corner. This shows why the QB will still read the MIKE linebacker even if the defense has already rotated to single-high. The QB still has the 1-on-1 opportunity to the single receiver, but the offense would still prefer to run the ball versus a five-man box. The defense fails to align correctly as the MIKE linebacker (No. 51) bumps out to No. 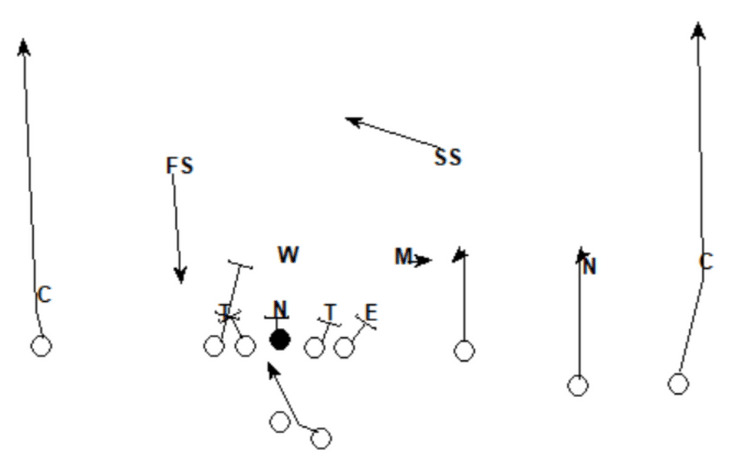 3 when the defense already has three defenders outside to match the three receivers to the trips side. This mistake is likely because of the offense’s use of tempo, but either way, the QB sees the MIKE outside the box, so he hands the ball off to the back as the offense now has five blockers for five defenders. With the defense in a 2-high shell this time, the offense has the 3-on-2 advantage on the MIKE and nickel defender. The MIKE plays the run, so the QB pulls the ball and shifts his eyes to his two hitch routes. The nickel defender jumps outside, so the QB throws the hitch route to his No. 3 receiver who is in open space in between the MIKE linebacker and nickel defender. The back bends back to protect the QB after he does not get the ball (if the MIKE linebacker were to bring pressure, the back would come off his fake and block him). Again, the defense is in a 2-high shell and the MIKE linebacker plays the run, so the QB will pull the ball and look to throw one of his two hitch routes to the trips side. 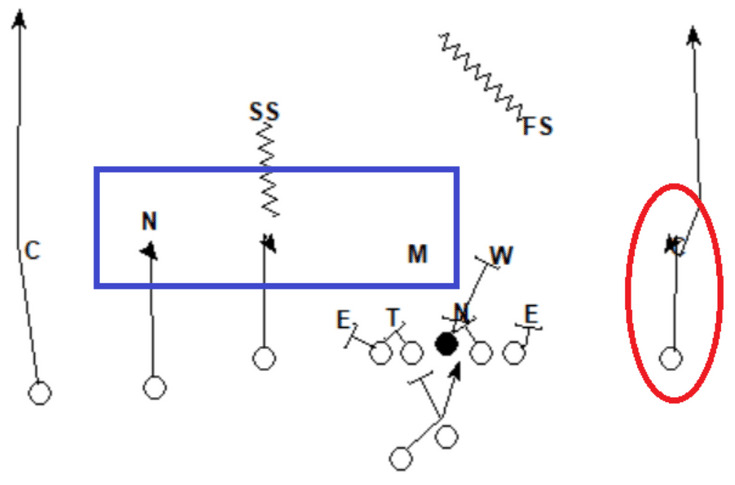 This time, the nickel defender dives in toward the box as he sees the run action, which places him in the throwing window for the hitch route to the No. 3 receiver. This leaves open space for the No. 2 receiver, so the QB throws the ball to him on his hitch route. The defense rotates to single-high on the snap this time, which leaves the offense with a 1-on-1 to their single side receiver. The QB sees this as he meshes with the back and reads the backside linebacker (No. 9). The read-key plays the run, so the QB, knowing it is single-high, flips his hips to find his single receiver and throws the hitch versus off-coverage. The weak-side outside linebacker (No. 44) is likely a flat defender on this play, but the run action holds him tight to the box, which opens up good space to throw the hitch route with an off corner. The read-key (No. 9) brings pressure, so the running back bends back to block him to keep the QB protected as he throws. 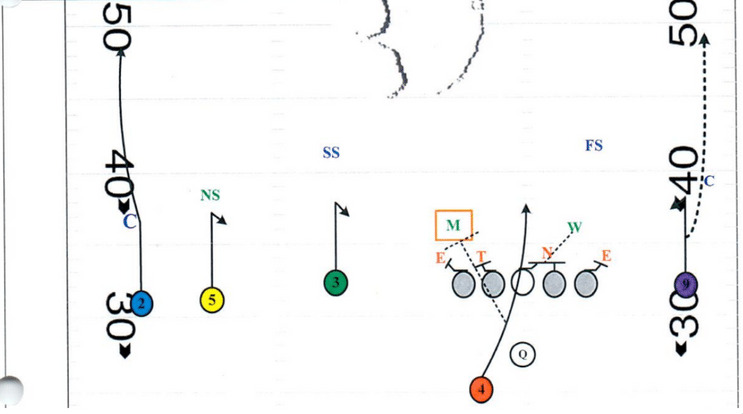 With the defense rotating to single-high to play Cover-1, the QB quickly reads the MIKE (No. 51) to confirm that he is playing the run before flipping his hips to find the single receiver. Because of the corner being in a press position, the receiver converts his hitch route to a fade. The receiver does not get a very good release and the corner is in a good position to defend the deep ball. Because of the corner being on the receiver’s upfield shoulder, the QB throws a “back-shoulder” throw to the receiver. This allows the receiver to turn and catch the ball away from the defender as the defender cannot see the ball coming. Although the offense did have a successful play here, this does show one of the cons of RPOs. Jon Gruden once notoriously said that RPO stood for “Ridiculous Protection Offense.” Although this does not render RPOs useless as Gruden implies, there is still truth in the statement, as RPOs can sometimes leave the QB exposed to take hits as he’s throwing because of the offensive line run-blocking rather than pass blocking. As is the case with every good play, there are still things the defense can do to gain the advantage and place the offense in a compromised position. It is important to understand what the defense can do to take away your base plays so you can build counters to defeat the defense’s expected reaction to your base play. One way the defense can stop this play is by expanding the MIKE linebacker to No. 3, causing the QB to give the ball while also dropping down the free safety into the box on the frontside of the run to gain an unblocked defender. The MIKE expands to No. 3, causing the QB to give the ball to the back. 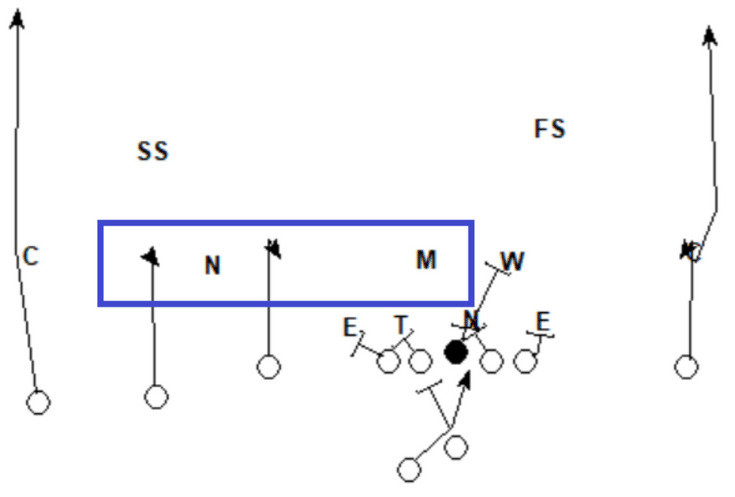 The 3-Technique on the frontside of the run occupies the B-Gap and takes on the G/T double-team, freeing up the free safety to make the play in the C-Gap after the back bounces the ball. Note also that the backside 3-Technique should not be unblocked on this play as the back-side guard should have blocked back on that defender, but this is a somewhat awkward front to run Inside Zone against, which could lead to missed assignments like this. But even if the offense were able to execute the blocking scheme correctly, the back would have still been forced to bounce the ball into the unblocked free safety. As I mentioned earlier, every play is not going to work against every look from the defense. No matter how good the play, the defense will always be able to do something to take that play away, but that is irrelevant. The important thing is that the offense has answers for the defense’s response to take away their original play and that they can game-plan their base plays for favorable looks. Hopefully, this article showed you a simple, yet effective RPO you can run against most looks from a defense.